This weekend I realized a dream of mine by attending some of the NBA All-Star Weekend festivities in New York City. I started off my weekend at the Adidas store in SoHo on Friday afternoon. During my train ride into the city, I saw on Twitter that NBA legend, Kareem Abdul-Jabbar would be appearing at the store at 4:30. I arrived at the store about an hour and a half early to fight the crowds and ended up being the fifth person in line. After the long wait, Abdul-Jabbar arrived to a huge ovation. When it was my turn to meet the legend, I shook his hand and thanked him for the autograph. 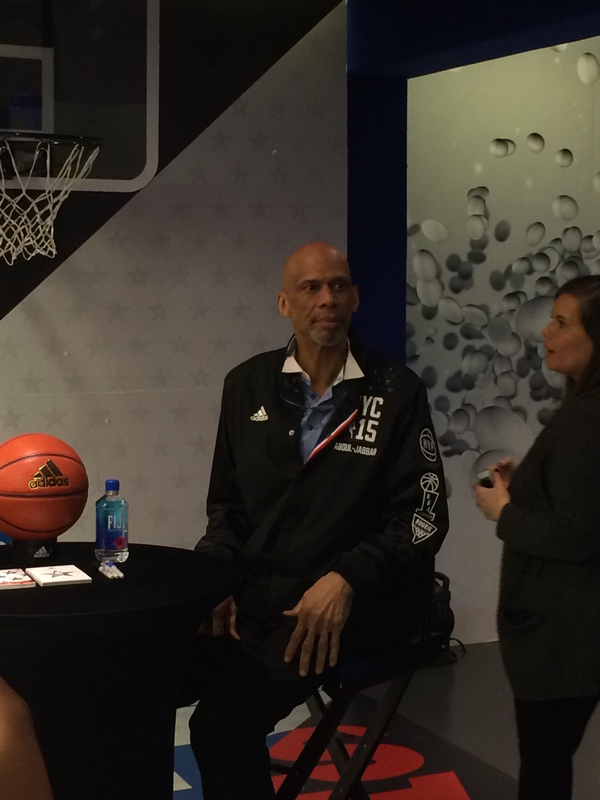 NBA Legend, Kareem Abdul-Jabaar signs autographs at the Adidas store in SoHo on Friday, February 13. My next stop was NBA House at Skylight at Moynihan Station down the street from Madison Square Garden. NBA House, formerly known as NBA Jam Session, is the NBA’s fan fest experience during All-Star weekend that includes games, giveaways, and appearances from past and present basketball players. I had tickets to the 6 p.m. to 9 p.m. session. Upon walking into the venue the Sprite booth, caught my eye and I walked over only to be asked to freestyle rap for a free Sprite t-shirt. Even though I love rap, I have no lyrical talent so the workers told me I could just talk for thirty seconds. I talked about how I always wanted to come to this event and how the Cavaliers are my favorite team. After receiving the giveaway from Sprite, I walked over to the Kia display, where a line was forming to meet New Orleans Pelicans forward, Anthony Davis. I have followed Davis since his freshmen year at Kentucky in 2011. He is having a breakout year and is a strong candidate for the MVP, but sat out Sunday’s All-Star game due to a right shoulder sprain. I got in line with 45 minutes to go before he arrived and that time was quickly passed with games of NBA Trivia. The line to meet Davis was very large so fans were moved quickly through the line. As I received my autograph, I thanked Davis and told him to get well soon, which he thanked me for. 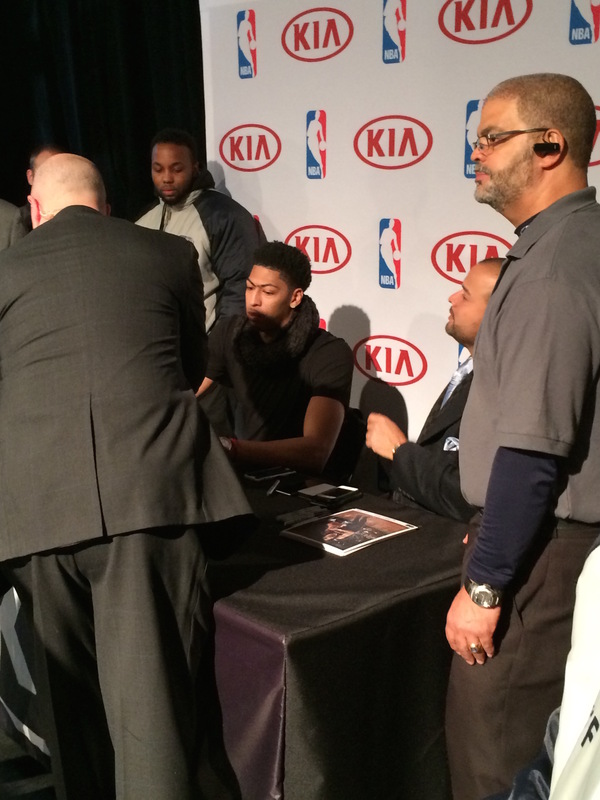 Anthony Davis signing autographs at NBA House on Friday, February 13. Next, I walked up a ramp into the larger part of NBA House. There I found various shooting contests and video game stations. There were also many giveaways including basketballs and mini-basketball hoops. At the main basketball court, Washington Wizards star, John Wall was running a shooting contest for children. Wall took the time to pose for pictures and sign some autographs for the kids, but quickly left once the contest was over. I sat in the bleachers at the main court and watched some other contests for the duration of the session. Washington Wizards point guard, John Wall, at NBA House. The tickets prices for All-Star Saturday night and the All-Star game itself were very expensive. I found that the next best thing was the All-Star practice at Madison Square Garden on Saturday morning, where I met a couple of my friends. The practice started with the Western Conference All-Stars. Western Conference and Golden State Warriors head coach, Steve Kerr was a shooter in his playing days, so he spent most of his practice putting his team through shooting contests. At the conclusion of the West practice, West starter, Stephen Curry and East starter, John Wall, had a shooting contest to determine the best shooter. The contest consisted of trick shots where neither player made a shot until the final round. John Wall won the contest with a crossover and three pointer on actor, Michael Rapaport. 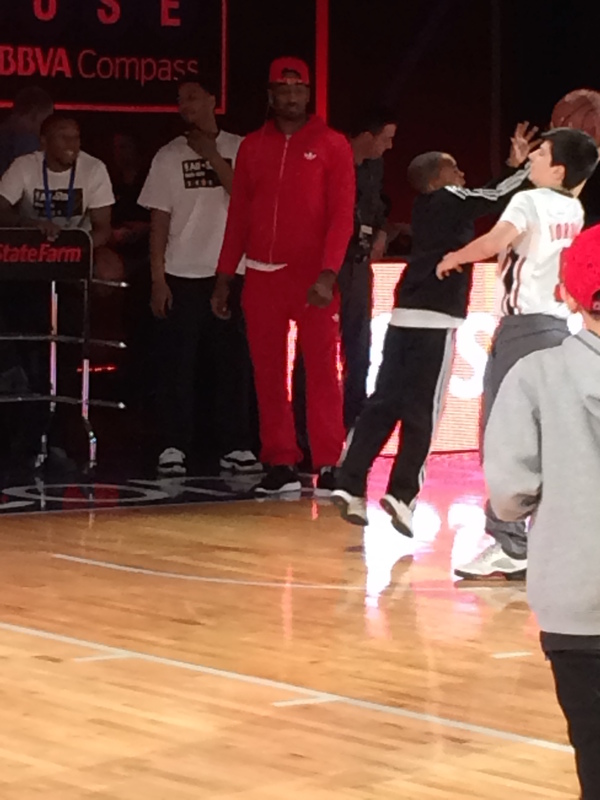 After the short performance from Nico and Vinz, the East All-Stars took the floor for practice. Eastern Conference and Atlanta Hawks coach, Mike Budenholzer, took his practice more seriously and had his team run through sets. During one of the sets with the starters, Cavaliers star, LeBron James, threw down a huge reverse two handed slam. The East squad ended practice with a half-court shot contest that included some lucky fans. During the contest, Hawks power forward, Paul Millsap, sank two half-court shots in a row. I thought the practice was a great time for an affordable price compared to other All-Star events. 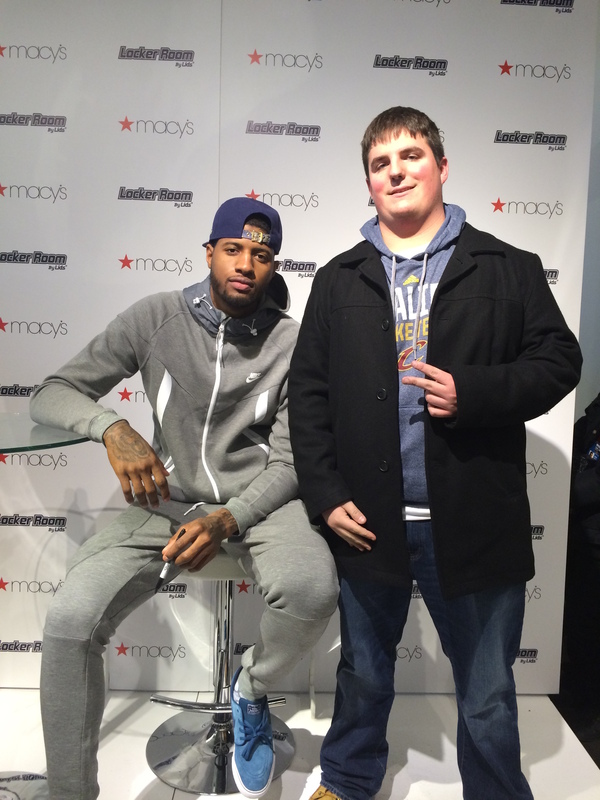 After practice, I met another one of my friends at Macy’s to meet injured Indiana Pacers star, Paul George. To gain access into the signing you had to buy $50 worth of merchandise so I purchased an All-Star hoodie. After waiting in line for over an hour I was told that George would no longer sign the free pictures Macy’s provided and would only sign the merchandise we bought. I was annoyed at this because a hoodie is not the ideal autograph item, but I was allowed to take pictures with the Pacers star. I shook his hand and wished him good luck on his comeback from the gruesome leg injury he suffered last August. Indiana Pacers star, Paul George and I at Macy’s Herald Square on Saturday, February 14. I began the final day of All-Star weekend by attending NBA House at LIU Brooklyn’s Paramount Theatre. The NBA House in Brooklyn was a scaled down version of the one in Manhattan, but it contained many of the same games. The NBA championship trophy, the Larry O’Brien Trophy, was on display in the venue. NBA Legends AC Green and Muggsy Bogues made an appearance to coach some shooting contests on the main court. 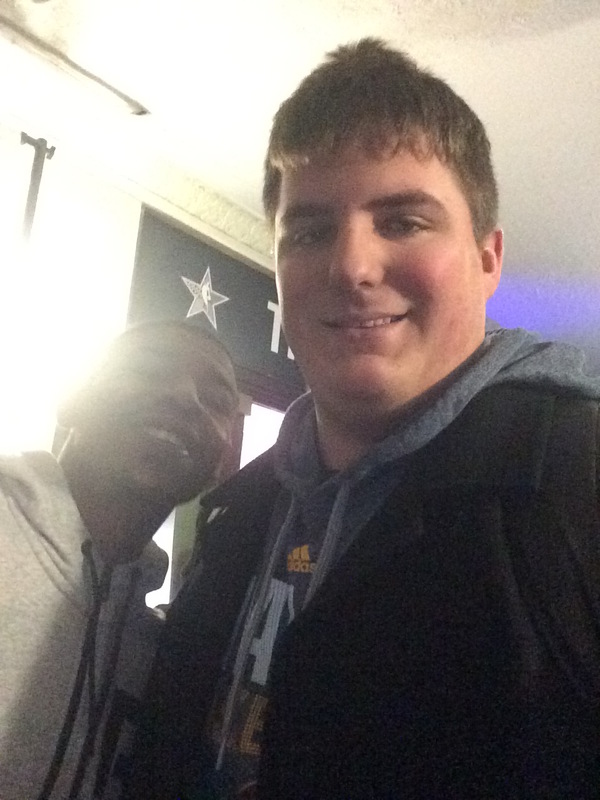 After the contest, I met Bogues and was able to snap a selfie with him. The rest of the session included more contests and apperances by the Philadelphia 76ers dance team and the Miami Heat mascot, Burnie. Charlotte Hornets legend, Muggsy Bouges, and I at NBA House Brooklyn on Sunday, February 15. Overall, I had an amazing time taking in the All-Star festivities this past weekend. I encourage any basketball fan to put this on their bucket list. The Cavaliers have mentioned that hosting the All-Star game is “on the radar for 2017 or 2018.” I am very hopeful that Cleveland will receive the bid for the game in the next few years due to the Cavs star power and the fact that the city will be hosting the Republican National Convention in 2016. However, there is one person who has said that he does not want Cleveland to host the game and that man is LeBron James. James was quoted in December saying “It would be too much for me. I think it would be great for us to host it, but hopefully I’m no good in that year if we get it.” LeBron is arguably the world’s most influential athlete in the world today and he would be a great host. The way I look at it is that if Carmelo Anthony can put off season-ending knee surgery and play in front of his hometown, then LeBron can overcome the emotional aspect and host for a city that loves him like a son.